Let me start this post off by saying how absolutely in love with these frames I am. We did this project last weekend and still every time I walk in to our bathroom they make me smile because they fit the space so perfectly. I feel like in the process of decorating all the rooms in our house this year I’ve learned to get rid of all the clutter and pick things that really stand on their own. 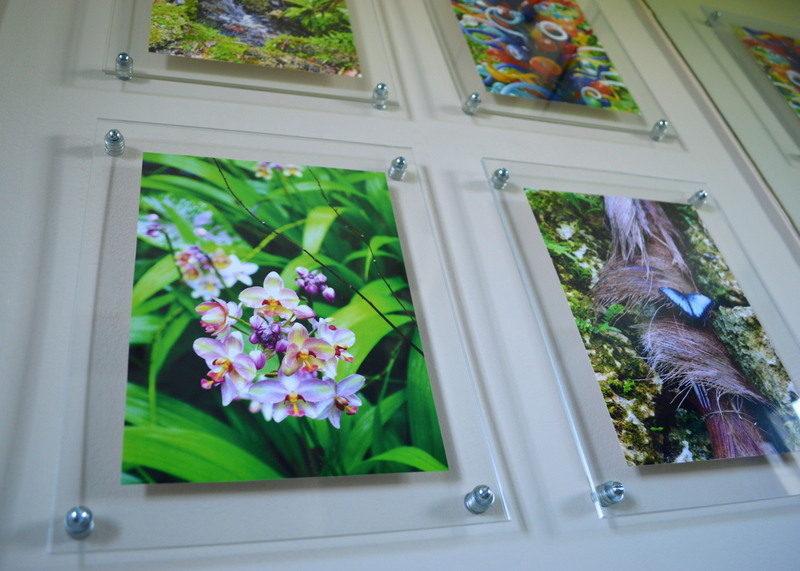 We wanted the bathroom to be really organic and sort of “nature-ish” so I knew I wanted to incorporate some of these photos on a wall that previously had floating shelves. Photographs are a fantastic way to bring a pop of color into a room without any major commitment because you can very easily change them out. These ones were photos I took on our trip to Miami at the beginning of summer (see some of that trip HERE) at the Fairchild Tropical Botanic Garden which is seriously my favorite place on earth. The things I photographed were so beautiful that I didn’t want to hide them in clunky frames and so I had planned on trying to find some sort of floating frames. The problem with that was that most of them have either white or black frames around the glass and neither one of those colors would really work and then it occurred to me that I could make my own without any wooden frames! After a quick pow-wow with my dad on the phone and LOTS of help from “my guy” at Lowe’s, we had all the supplies and came up with these! I love that they look like an art gallery and that they really let the photos do all the talking. The added benefit of these is that they appear to take up much less space because they’re see-through so you can make a big impact in a smaller space.! Our frames are 8″ x 10″ with 6″ x 8″ photos in them, you get plexiglass in any size you like (most hardware stores will cut big sheets for you) but these 8″ x 10″ ones came precut and that was the size we wanted anyways. We played around with photo sizes and this was the one we liked best but you could go smaller or bigger (you can even go the whole size of the frame) depending on what you like best. You’ll need two sheets of plexiglass for each frame. Start off by marking your plexiglass (find the sheets we used HERE) where you want to drill your screw holes, I marked mine with a dry erase marker .5″ in from the edge and .5″ up from the bottom in all four corners (1). 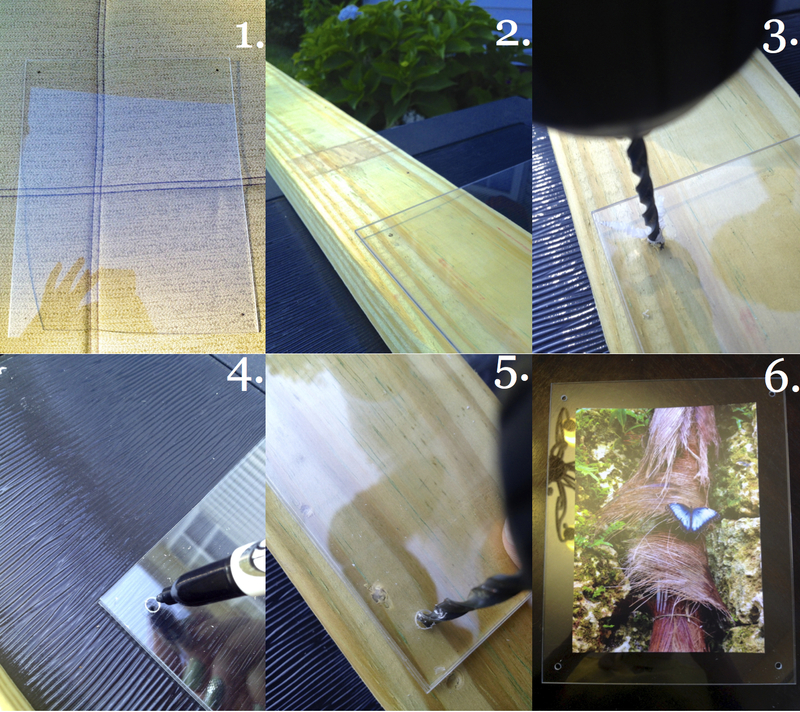 Set your plexiglass on top of a piece of wood that you can drill in to (2), preferably a piece that big enough to fit the whole sheet of plexiglass on (we just had this 2 x 4 so it’s what we used but you run less of a risk of cracking the plexiglass is it’s totally flat while you’re drilling). Fit your drill with a bit that corresponds to your screw size. We used #8 x 1.5″ zinc plated wood screws (find them HERE) and you want the hole to be just slightly bigger than your screw. VERY SLOWLY begin drilling your hole (3)… this may seem like it’s going to take forever but the plexiglass is really easy to crack so holding slow and steady will be worth it! Once you’ve drilled through the plexiglass and into the wood, put the drill in reverse and very slowly back the bit out of the hole. Once you have all four corners drilled on one piece, we found it easiest to place that sheet over the one that will be it’s match and mark the holes on that one based on what you just drilled (4) because while they should all the be the same distance they’re all slightly off. This will ensure each set will match up perfectly. To make even more sure the holes lined up, we left the sheet that was already drilled right on top of the new sheet and drilled the holes (5). This is the equivalent of russian roulette plexiglass style but we only snapped one corner out of the 36 we drilled so it can be done! After you have all your sets pre-drilled, center your photo on the backs and secure it with a piece of scotch tape (6). We found it easiest to arrange these back pieces on our wall until they were where we wanted them, then we marked the holes and pre-drilled into the wall. Then you can sandwich the back pieces with the photos with the tops that correspond to that set and stick your screws through all four corners. We used nine of THESE on the back of each screw to serve as our “spacers” from the wall. You can use as many or as little of these as you like, just use washers that match up with your screw size. Carefully use a screwdriver to screw the frames into the wall, being sure not to tighten too much, or the plexiglass may crack! I love these frames! Such a modern and clean look! Thanks so much! That’s what I love about them too!